Physical therapy academia is always seeking ways to improve DPT student exercise prescription skills. Typically the DPT student exercise prescription education begins with being shown a variety of exercises coupled with particular diagnoses or conditions for which those exercises may be appropriate. Evidence based studies may be provided to further demonstrate the exercise prescription is warranted. And there is nothing wrong with this approach. However, from my experience working with physical therapy students during clinical internships, there are still areas where they may struggle. The DPT student exercise prescription skills may be fine in knowing which exercise are suitable for a certain condition but not so much in the actual details such as exercise dosage (sets, reps, resistances etc.) and progressions of programs. 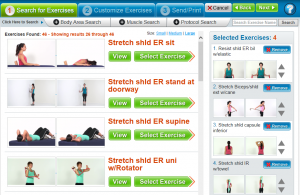 Following are suggestions to improve in those areas using Exercise Pro Live prescription software. One method for improving DPT student exercise prescription is to provide the student with a “paper patient”. For example one scenario could be a 20 year old male that is 2 weeks s/p ACL reconstruction surgery and provide them with objective findings such as ROM, strength and so on. 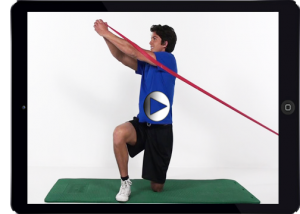 The most basic use is to utilize the exercise software to formulate a basic exercise program. Then the DPT student would provide the rationale as to why those exercises are appropriate for the patient (closed chain, open chain, positions, etc). This would also apply to outlining the goals they are working to achieve with that specific exercise program and provide the reasoning why those exercises are the best to attain those goals. The second phase would be to determine the frequency (number of time per week, per day), dosage (resistance amount), type of exercise (active, assisted etc.) and equipment. The DPT student provides the program to the instructor and must provide validation for each of the parameters. This may include what types of tissues are being targeted (deep connective, muscle, tendon etc.) and why that particular dosage targets that tissue. For teaching home program progression, the same tactic is used but this time they are provided a paper patient that is now 6-8 weeks post op with more objective findings and would do the same for this scenario. This routine can be used for a variety of specialized patient types and diagnoses with various progressions. One way to increase DPT student exercise prescription skills is to break the class into groups, each group working on a multitude of different patient scenarios. Once finished, they present their results to the rest of the groups to help everyone learn different options, thought processes and clinical decision making as it relates to therapeutic exercise prescription. Another great application that Exercise Pro Live software can help with relates to patient compliance. Should they provide three exercises, six or twenty? Why? Will printed handouts work better than video? Why? Students could use this premise as a thesis as well. A therapeutic exercise class instructor may use the exercise software to provide a group classroom discussion on substitution patterns for exercises as they pertain to specific injury types or conditions. What type pattern would occur, how can it be resolved? What can be done if it cannot be resolved. Finally, the last use of Exercise Pro Live software, for enhancing DPT student exercise prescription skills, is to have it available for clinical internships. After using Exercise Pro Live in the classroom for a semester, when the DPT student goes into the clinical setting, they have a modern clinical tool and are familiar with its use. This alone can provide security and confidence while treating real patients.